By Anna Pawlik - PhD candidate. How to calculate the atomic number, the atomic mass and charge or numbers of protons, neutrons, and electrons? 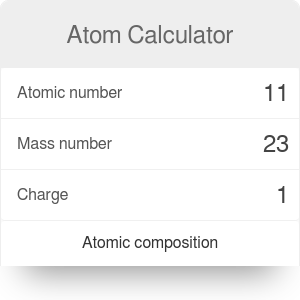 The atom calculator is a tool for calculating the atomic number and the mass number based on numbers of atom components - protons, neutrons, and electrons (or vice versa). In addition, you can define the charge of ions with known numbers of protons and electrons. This article will provide you with the definition of an atom, atom components, atomic number and mass number, as well as with a short step-by-step tutorial of how to calculate numbers of atom components. Atom is the smallest constituent unit of matter that retains the properties of an element. A typical atom consists of a nucleus and electron cloud. Atom components are positively-charged protons and electrically neutral neutrons in the nucleus and negatively-charged electrons orbiting this nucleus. Protons and neutrons are called nucleons. Atoms are electrically neutral because they possess an equal number of electrons and protons. However, when an atom has an unequal number of protons and electron, it has an electrical charge and they create ions. If an ion has more protons than electrons, it is positively charged and is called a cation. Conversely, if an ion has more electrons than electrons, it is negatively charged and is called an anion. Some atoms can split into smaller parts (lighter nuclei). If you want to know half lifetime, you can use Half Life Calculator in order to calculate the number of nuclei remaining after a certain time. Atom is uniquely identified with the atomic number (symbol Z). The atomic number is the number of protons present in the nucleus. In case of uncharged atoms, the atomic number is equal to the number of the electrons. In contrast, in ions, the number of electrons is the difference between the atomic number and the charge of ions. In cations, there are fewer electrons than protons, while in anions, there are more electrons than protons. The number of neutrons in a given element, however, can vary. The variants of the same chemical element with a different number of neutrons are called isotopes. Protons and neutrons determine the mass of an atom. Mass number (symbol A) is a sum of numbers of protons and neutrons. Choose your element. Let’s assume that it is the atom of sodium (Na). The charge is 0. Find the atomic number (Z) and mass number (A). They are equal to 11 and 23, respectively. Alternatively, you can also calculate the atomic number, atomic mass, and charge. Choose your element. Let’s assume that it is the sulfide anion. Find the numbers of protons, neutrons, and electrons. They are equal to 16, 16 and 18, respectively. Of course, you don't have to perform all of these calculations by hand! Type any three values into this atom calculator and watch it do all the work for you. Anna Pawlik - PhD candidate. Atom Calculator can be embedded on your website to enrich the content you wrote and make it easier for your visitors to understand your message.